My first time cooking French…. Or was my Ratatouille my first? Well, ok, my first French main course. 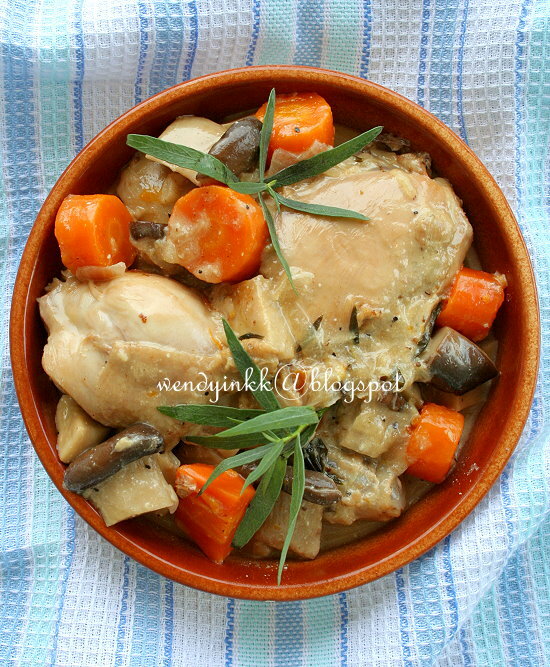 I never knew of this dish until I went googling for chicken with tarragon, and voila, out came this recipe and I am soooooooo caught by it. 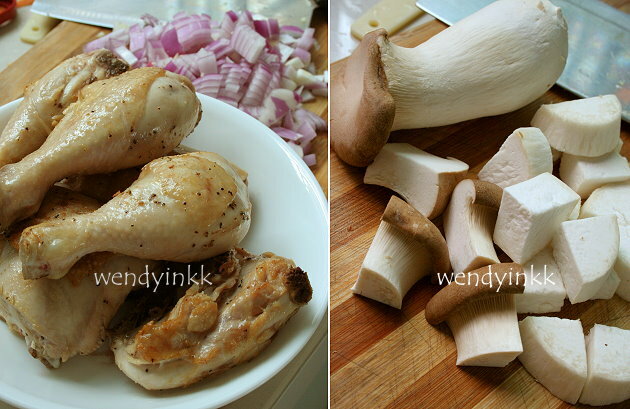 And it was just nice that I also have some mushrooms, although not the exact type, but oh well, it might work well. And this is also my first time cooking with white wine. Before this I always shy away from dishes that call for wine, simply because white wine is non-existent at home. My hubby keeps a few bottle of red wine, but not white. I purposely went to get myself a bottle of cheap white wine for cooking(not for this dish, but just in case I needed some)… but no matter how cheap, it still cost me RM37, about that. Not that cheap too, but cheapest at Tesco. I don’t know if it’s me or it’s like this… after I poured the wine (before the water), the gravy looked white, as if I added milk in. Can someone give me some insight? I tasted it and it was so delicious! LOL. And Lydia said so too. I served this with boiled potatoes or maybe next time with rice. Fluffy basmathi will be a good choice. 1. Marinate chicken pieces with salt and pepper for half an hour. 3. Heat a pot, put in light olive oil and brown chicken pieces over high heat until slightly golden. Dish up and set aside. 4. Put in onions and garlic and sauté on medium heat until onions look translucent and fragrant. 5. 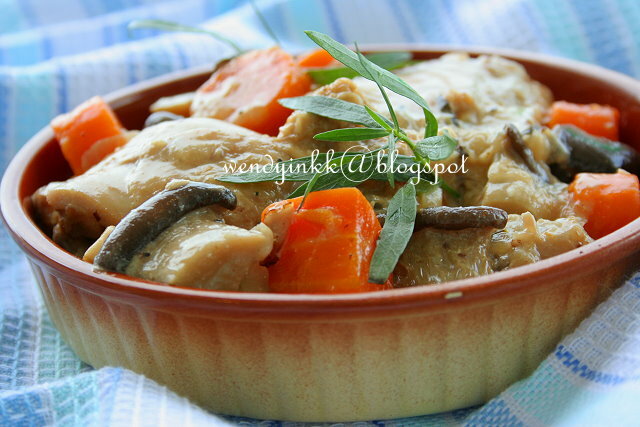 Put in mushrooms and butter, and cook for few minutes, add in carrots. 6. Pour in white wine to deglaze the pot. 7. Return chicken to pot and put in tarragon and enough water to cover the chicken. 8. Simmer on medium low heat with lid on for 30 minutes. 9. Remove lid and turn heat to high and let the liquid reduce to preferred amount. 10. Taste and adjust with salt. 11. Turn off the heat and put in cream. Lightly stir and it is ready to be served. This is my type of food though I have never use Tarragon before. This dish does not have much gravy, don't they? I am sure it must taste delicious; you have rated it delicious and so I got to try this one day...but I only have red wines....huhuuu....have to go and buy..... Oh, did you add any extra water in other than the wine and cream? 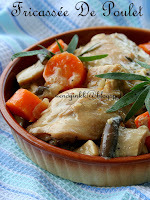 I made Chicken Fricassee only. Recipe was from Martha Stewart. It was nice. I might try yours next. Yes I did, at step 7. Yea, me also very reluctant to buy wine just for cooking. I bought a bottle of red for some recipes, but before i could say STOP, my hubby sapu the whole bottle with my mom and aunt at a dinner. Tis recipe sounds nice and easy, will give it a try, after i stick a huge label FOR COOKING ONLY on the wine bottle first. No white wine, always got drank up before I can cook anything! This looks like one of those dishes cooked up in one of the cooking shows on tv! Looks good. Very nice recipe... I like!